It was the Monaco Grand Prix in the here and now. But, throughout, many minds were on that two years ago. Then Daniel Ricciardo dominated the Monaco weekend, but lost the win due to Red Bull botching a pitstop. This time he dominated if anything to a greater extent - topping every single practice and qualifying session. Again he led the race. Again though he met problems - this time with his engine. But this time he overcame them to win. In more than one sense he righted a wrong. 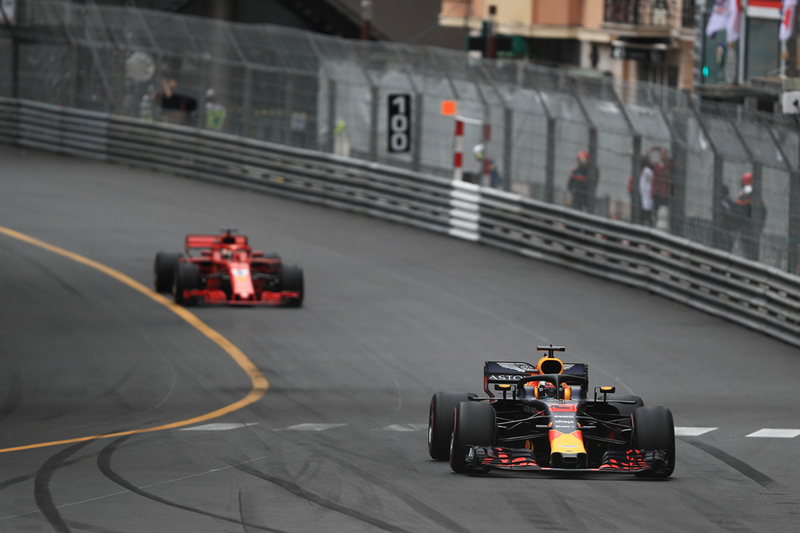 To begin with the race was typical Monaco. The poleman Ricciardo led from the line and looking untroubled. Then after the round of what was predicted to be the solitary stops all among the frontrunners stayed in the same order. And track position is ten tenths of the law here. But another thing typical of Monaco is that it can bite. Things, somehow, happen here. Ricciardo knows this better than most. And at around a quarter distance something happened. Ricciardo reported a power loss. He was told it wouldn't get better either. Ominous head shakes and facial expressions were visible in the Red Bull pit. Losing this revered race again looked a matter of time. We later were told it was an MGU-K failure, costing him 25% of his power or 2.5 seconds a lap. The way these cars are it has a knock on impact on rear brake temperatures, fuel and tyre handling too. The brake bias has to be massively altered - making lock ups more probable at the last track you want them. But Ricciardo and Red Bull's game became clear. They were going to tough it out. This is Monaco after all. Remember what we said about track position at the Principality. Second-placed Sebastian Vettel in his Ferrari - with tyre problems but also perhaps happy with what he had from the title angle - didn't swarm all over Ricciardo. Mercedes's Lewis Hamilton in third - with his own tyre complaints, in his case about graining - and Ferrari's Kimi Raikkonen in fourth didn't steam in either though did chip at the gap. Adding to the fun next up, just behind, was Hamilton's team-mate Valtteri Bottas in fifth who all alone among the frontrunners put on super-softs rather than ultra-softs in his stop, and which looked the tyre to be on in pace and longevity. At another point Nico Hulkenberg got the accolade of the fastest out there - on tyres that were 43 laps old. 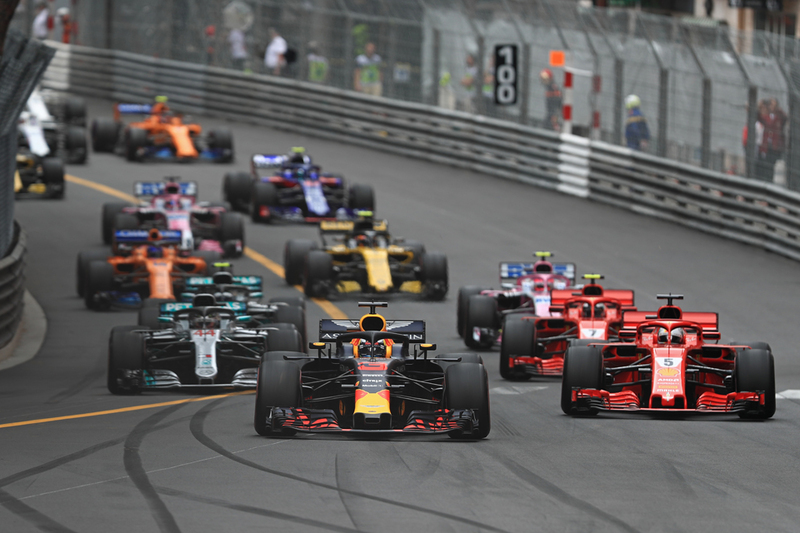 Hamilton seemed minded to add to the fun further by advocating pitting for a second time - trouble was the leaders' slow pace meant he couldn't change and still be ahead of the midfield runners, led by the impressive Esteban Ocon in his Force India and Pierre Gasly in the Toro Rosso putting a long strategy to good use. Hands were forced into a one-stopper. But we've seen this before at Monaco. Spells of the race with David Coulthard in 2002; Vettel in 2011; Mark Webber in 2012 - often the first on the track is about the last on pace, but hangs on for grim death. And, given where we are, is able to. In the first of those cases - when DC underwent one of Michelin's notorious tyre graining phases - then-next guy up Juan Pablo Montoya speculated that a F3000 (an F2 forerunner) car could be put on Monaco Grand Prix pole and most probably win. And that is, roughly, what happened. Ricciardo grimaced it out and won. Vettel remained a second or so behind for the most part but didn't especially threaten. While the rest from Lewis down fell away a bit - by the end he'd sunk 17s off the lead. Even Vettel fell away, apparently unable to get his tyres into range quickly after a late Virtual Safety Car period and losing five seconds in a blink - later nearly binning it an Mirabeau for good measure. At this point he ceded the fight. "I got it buddy," said Ricciardo at last on the radio at around the same point. All finished in the same order. 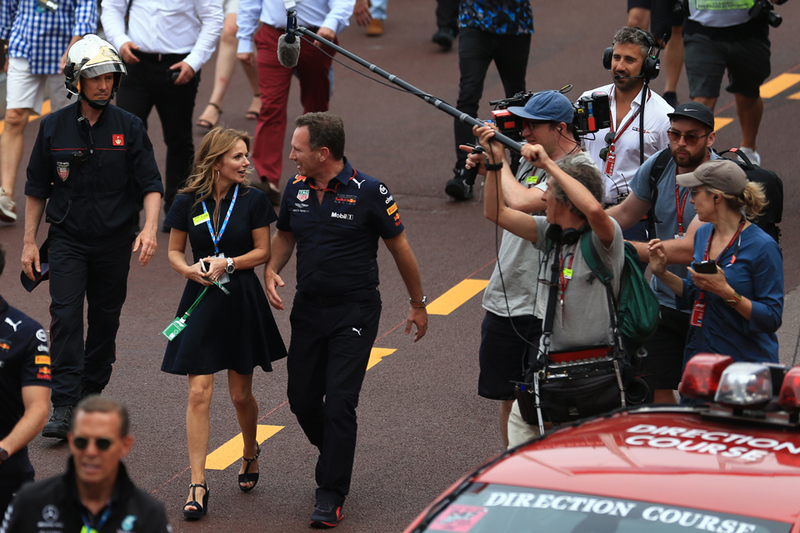 "I don't know how you did that, Daniel," opined Ricciardo's engineer Simon Rennie on the radio. "Cheers boys. Redemption," replied Ricciardo, summing the matter up. His boss Christian Horner then likened his drive to Michael Schumacher finishing second in the 1994 Spanish Grand Prix having been stuck in fifth gear for the most part. 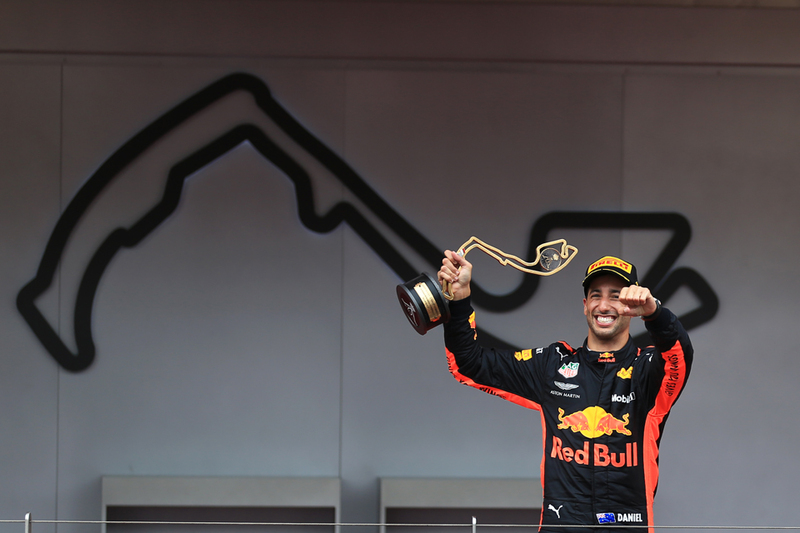 "Two years in the making this," Ricciardo continued before the podium, "we had a lot to deal with during the race. I felt a loss of power and I thought the race was done - we got home just using six gears. "We won Monaco - feels good!" It vaults him to third in the drivers' table too with his two wins matching Hamilton and Vettel's respective totals, albeit with a 38 point deficit to Hamilton at the top. Vettel, for one, refused to rule Ricciardo out from the championship angle. No one was denying Ricciardo's status as a complete driver. 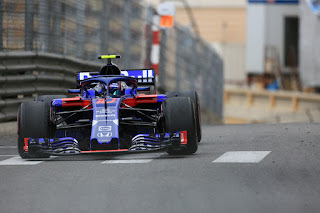 "At the beginning it looked like it [the problem] would slow the car further down," added the normally impassive team adviser Helmut Marko. "Then we settled it, we changed the set-up, he changed his driving style - so unbelievable." "They were telling me on the intercom we would have to retire in one or two laps, I said we're at the Monaco Grand Prix - we keep going," added Horner. "You can hear his [Ricciardo's] composure in the car when something goes wrong. There was no panic. He worked it out. I can't praise him enough. He's dealing with all the switch changes, all the stuff he has to manage - and he totally nailed it. "He was pulling away from Lewis Hamilton with no MGU-K!" Ricciardo's team-mate Max Verstappen, starting last after his adventures yesterday, made it up quickly to the outer reaches of the top 10 though from lap 20 got stuck for a while behind a pitted Fernando Alonso (Alonso later lost his perfect finishing record in 2018 with a broken gearbox). Max's stop however was late allowing him to attack on the softest tyres in the final 30 laps. He found a haphazard path past Carlos Sainz's Renault to get ninth but that's where his progress ended. The afore-mentioned Ocon and Gasly got worthy sixth and seventh place finishes respectively, just ahead of Hulkenberg and Verstappen. Sainz completed the scorers. Monaco - as noted - can be a cruel master. But there's a reason drivers keep coming back. As no victory is sweeter, nor more of an achievement. That's even without hitting any problems. Virtually all of the giants have won here. Today Daniel Ricciardo, at last, joined them.